A multi-vehicle crash, apparently initiated by a wrong-way driver on northbound Route 24 in West Bridgewater, took the lives of two people in the early morning of Sunday, July 15, 2012. Four vehicles were involved in the crash, in which a wrong-way driver struck another vehicle head-on. The car may have then struck at least one other vehicle. Police released the names of the individuals involved in the crash and identified the wrong-way driver, who was one of the deceased. They are reportedly still investigating additional details of the crash. Police responded to the crash at approximately 3:30 a.m. Sunday morning. A 19 year-old woman was reportedly driving a 2010 Toyota Corolla the wrong way in the northbound lanes of Route 24 near Exit 16. That stretch of highway consists of three northbound and three southbound lanes separated by a concrete median. The Corolla had a head-on collision with a GMC pickup truck driven by a 44 year-old man. The Corolla flipped after the impact and may have struck another vehicle. The GMC pickup truck burst into flames. A passenger in the pickup truck escaped from the truck and reportedly had minor injuries. The drivers of the Corolla and the GMC were both pronounced dead at the scene. Two other vehicles were involved in the crash, a 2002 Chevy Tahoe and a 2003 Chevy Cavalier. The Corolla may have collided with one or both vehicles, but media reports are unclear as to their exact involvement. Emergency responders transported the drivers of both vehicles to a Brockton hospital with "non-life threatening injuries." Police closed the entire highway shortly after arriving on the scene, in part due to a large amount of debris left on both sides of the road. They reopened the southbound lanes at around 7:00 a.m., and the northbound lanes reopened at 10:25 a.m. Police did not release the names of the people involved in the crash until Tuesday. The Collision Analysis and Reconstruction Section (CARS) of the Massachusetts State Police are still investigating physical evidence from the crash. Police say that they still do not know how the Corolla came to be travelling the wrong way on Route 24. While the specific cause of this accident remains unknown, the densely-populated Brockton area presents a broad array of risks for drivers. Late-night driving presents its own additional risks, with a greater chance of poor nighttime visibility, driver fatigue, or other driver impairment. People injured, or the family of someone killed, due to another driver's negligence or illegal activity that causes a car accident may be able to recover damages. A claim for negligence requires a plaintiff to prove that a defendant breached a duty to the plaintiff that caused measurable damages. All drivers owe a duty to others on the road to drive safely, so a car accident claim usually only requires proof of causation and damages. The lawyers at Sousa & Sousa represent clients throughout Easton, Bridgewater, Brockton, Stoughton, Taunton, and other surrounding communities. To speak with a skilled Brockton personal injury attorney today, you may call our Taunton office at (508) 823-6111 or our Brockton office at (508) 230-5300, or you may contact us through our website. 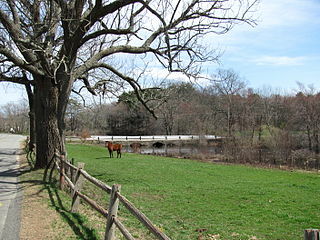 Photo credit: 'A field on the Town River, West Bridgewater MA' by John Phelan (Own work) [CC-BY-3.0], via Wikimedia Commons.